Captain Richard Steele was a founding member of the Atlantic Chapter of the Rhododendron Society of Canada (RSCAR) and supported the creation of the Atlantic Rhododendron & Horticultural Society. He faithfully attended, and contributed to, meetings and programs. 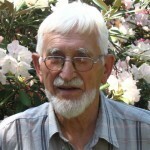 A mentor and friend to many, and with an international network of plants people, he was a major influence on horticulture, locally and further afield. RSCAR members in the early days established the tradition of the annual Steele Lecture, the objective being to bring a top-ranking plants person to Nova Scotia as a guest speaker. Captain Steele died March 14th 2010. Many people offered words and stories honoring ‘the Captain’. Here is a link to the tribute page for Captain Richard M. Steele. If you have memories, stories, or photos of Captain Steele to share, please send them to atlanticrhodo@gmail.com. In June 2010, amid the spring profusion of bloom and among many of his friends in the Atlantic Rhododendron and Horticulture Society, Bowater Mersey dedicated Pine Grove Park in Captain Steele’s memory. Captain Steele’s friend, Walter Ostrom, worked with the Nova Scotia Agricultural College, now the Dalhousie University Agricultural Campus, to establish the Captain Steele Endowment Fund and Scholarship. To celebrate Capt. Steele’s work as one of the great horticulturists of his generation, this fellowship will be awarded to a graduating student for post graduate study and research. The emphasis of the fellowship will be placed on developing an advanced level of appreciation for horticulture. 1 Visit the Dalhousie donation page at https://alumniapps.dal.ca/giving/giving.php Find the “Area I’d like to support”, click on ‘Specify” , and type in “ Capt Steele Memorial Scholarship”. 2 Contact a Donor Relations Officer, Dalhousie University, Faculty of Agriculture, External Relations PO Box 550 Truro, NS B2N 5E3 902.893.6721 (work) for a brochure and donor form.